Nobile di Montepulciano from Poderi Sanguineto 1 & 2. There are no herbicides or pesticides used here. The fermentations are done using indigionus yeasts in either concrete vats or old botti of slavonian oak. The results are an exciting revelation of focused, clear terroir wines from a region most people associate with a forest of spoof. This visit at Poderi Sanguineto 1&2 took place in April, 2013. Dora Forsoni is probably the coolest person I know. Even with the language barrier, she manages to be one of the funniest, warmest, friendliest, brutally honest and passionate people I've ever met. Spending time with her at the Sanguineto farm has been a true inspiration on both of my visits. In LDM's portfolio of characters, Dora is up there at the very top. We arrived in the late afternoon, and were greeted by Patricia. She quickly filled us in on all the juicy animal gossip, namely that one of the geese is in love with one of the hens and its chicks. It follows them around at all times, protecting them from danger. Dora was busy plowing a new, 2h parcel she planted this year, so we walked over to say hello. After dramatically pulling up in front of us and jumping out of her tractor, the visit officially started. 1 h of this new plot will be used to produce IGT Rosso, and the rest will go into Vino Nobile and Bianco. In Sanguineto's case, the Rosso and Vino Nobile grapes have always come from the same vineyards, but a newer law forces estates to claim which grapes will go into what for all new plantations. In total, the farm is 35 h, and 4.7 of those are vines. Everything is and always has been in massale. Here's a video I found searching for "hopping off of tractor" in hope of illustrating Dora's dramatic entrance. The new plantation is next to a large portion of the old vines, which we checked out next. As you can see, the rows have all been freshly plowed with a tractor. Dora does this twice a year. Chemicals have never been used in the vines, and Dora is very much against any manipulation of the plant, particularly rognage, the process of cutting off the tops to create more sunlight and aeration, or alternatively to make more room for tractors and not having to tie them back up as they grow. "Wineries that cut the top of the plant are doing the equivalent of cutting a human's veins. The plant stops concentrating on producing the fruit, because it needs to divert its attention to healing its wounds." In a curveball twist none of us expected, Dora started breaking off vine stems for us to taste! The idea was to make us understand why Caprioli (little dear animals, no word in English) -a big problem in many viticultural regions- love eating these so much. It was a mix of bitter and sweet, and reminded me of lemongrass. After finishing up our snack, it was olive tree time. From there, we were off to the wheat fields, which take up a significant portion of land. Unsatisfied with our previous snack, Dora started peeling off an un-blossomed wheat plant for us to taste. She seemed pretty happy with the results. Walking back, Dora started complaining about how the tractor work had gotten dirt all over her. After taking off her sweater to reveal a tank-top any thrift store aficionado would die for, she let her hair down and looked like a member of the best heavy metal band you've ever heard. You can watch this 1986 masterpiece in its entirety here. Totally worth it. Here are some pictures of Casa Dora, aka "Dora's house". "The life of the contadina!" I've always loved this wine, and it's particularly fruity and generous in 2012. The pressed juice ferments in an open concrete vat with less than 24 hours of skin contact and no temperature control. It then ages in concrete tanks. We also tried the 2012 IGT Rosso, which was delicious and incredibly balanced despite its 15 degrees of alcohol. At this point, Dora said she couldn't stand being so dirty anymore, that she had dirt EVERYWHERE (even in her nose!) and that needed to shower immediately. When she was done, she returned in her swanked out, night-on-the-town outfit and we headed to the aging cellar to taste more. Everything was tasting really good, including the homemade "slayed and made" wild boar sausages served up to accompany the wines. One distinction Dora made sure to accentuate was that the wines are made with Prugnolo Gentile, Canaiolo Nero, Mammolo and local strains of Sangiovese. "There are over 100 types of Sangiovese mutations in Italy. They are territorial. The consumer wants a simple explanation, but when they want to talk about Sangiovese, I ask them "which one?" This got us talking about tradition and how it continuously keeps getting flushed down bureaucracy' toilet. You can now release a Vino Nobile as long as it's spent 1 year in barrel, six months in ANY container (wood, concrete, stainless, fiberglass, whatever) and 6 months in bottle. So by following the "old" law, Sanguineto releases their Nobile a year late. Ironically, the Rosso they've always intentionally declassified could technically be labelled a Nobile now. "Here we have centuries of tradition, and with a few new laws, everything is up in smoke." Another law that recently passed? 30% of ANY grape can be used "in reason" to produce a Vino Nobile. "This was a direct result of the Brunello scandal. Instead of getting busted for putting something you weren't allowed to into the wine, just change the law!" The visit ended with a quick giro to the 0.7 h parcel that produces the IGT Rosso Toscano. Dora rents this parcel. The grape grown here is the Nero Toscano strain of Sangiovese. This is the only wine Dora bottles as a mono-varietal. 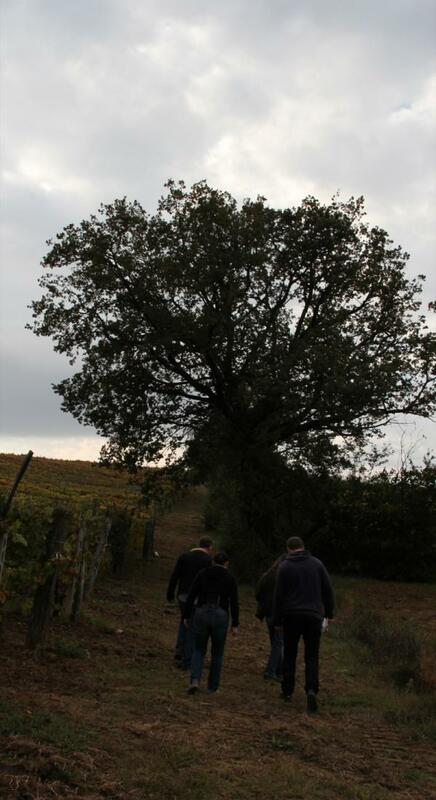 This visit at Poderi Sanguineto 1&2 took place in November, 2011. 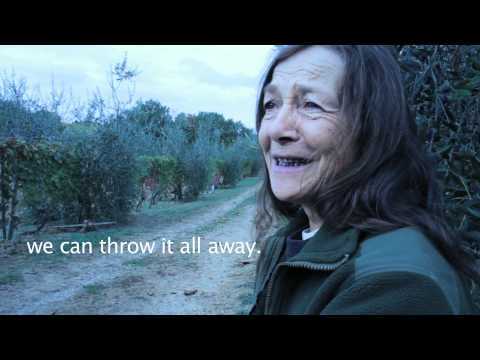 Dora Forsoni runs the Sanguineto estate with her life and business partner Patrizia Castiglioni. 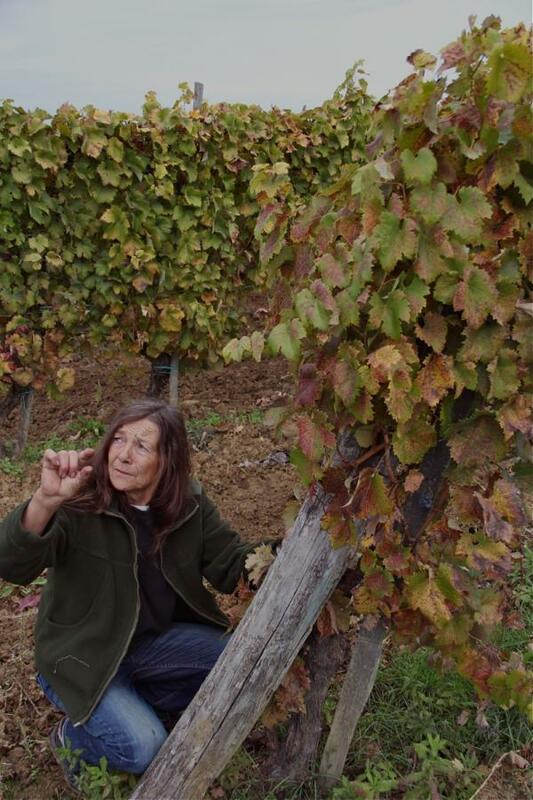 Dora does all the viticultural work alone, taking care of 100% of the vine maintenance: she works the soil, prunes and ties every vine of her 3.5 hectare estate by herself, and the only time someone else ever steps foot in the vines is during harvest when a small team of friends helps out. As you could imagine, Dora is one tough cookie. "4 deer, 4 bullets. I shot each one straight in the heart! Only males, because they make the best trophies." Please don't read into that as some kind of feminist thing: Dora showed us the heads (trophies), which she simply explained make better mantle pieces because of the antlers. Obviously she eats every last bit of each animal, and butchers them herself. She's been working the family farm her entire life, and learned everything she knows about agriculture, viticulture and vinification from her father; her work in the vineyards therefore leans less on philosophy and more on tradition; a tradition that results in much purer, honest wine than 99% of her neighbors. She can't weigh more than 110 pounds. 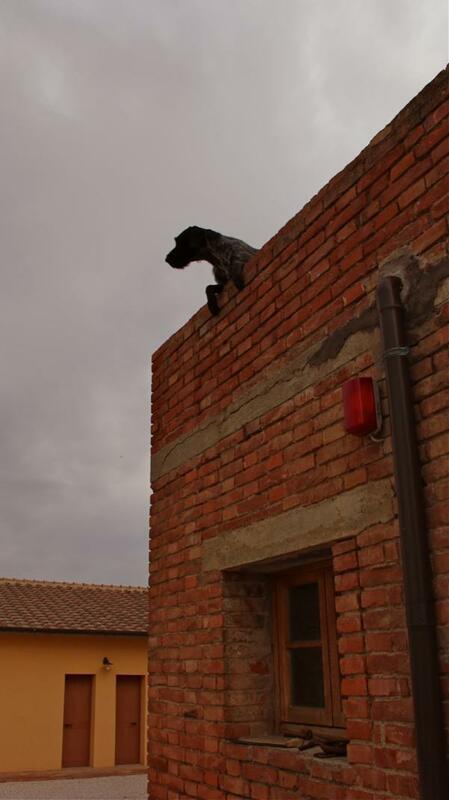 When we arrived, we were warmly greeted by Ali, the dog pictured above. His specialty is catching rabbits, and they can't let him loose on the farm, otherwise the free roaming chickens and geese would be in for it. Dora let us in and told us she was glad we were here. In the kitchen she was roasting freshly picked chestnuts and preparing a wild board stew (from meat she'd hunted a few days earlier) with polenta. 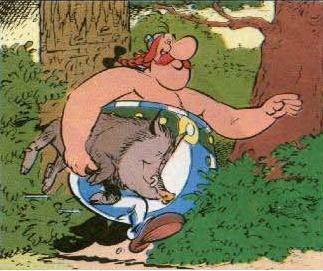 I've always had a thing for wild boar because of the french comic strip Astérix, where the Gauls are constantly seen eating sanglier. It was one of the best dishes I've ever had. Josefa had thirds. "Kevin! Kevin! Like Kevin Costner! Haven't you seen Balla coi Lupi?" 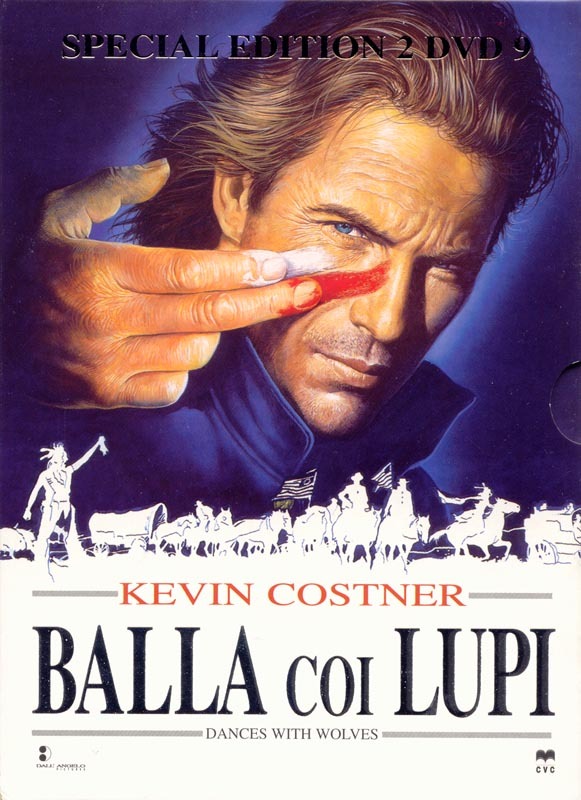 "Kevin Costner: Balla coi Lupi". Besides the food and hilarious 90's movies references, Dora keyed us in on some interesting aspects of her work and that of her neighbors. First of all, I've never met a grower who so passionately expresses how much they love their wine. With every bottle opened, Dora exclaimed how "fantasic" and "beautiful" and "delicious" it was without a shred of pomp or attitude. In the context of our meal, it was hard to disagree. I really think my father was on to something when he wrote that a to truly understand a wine, you need to understand the person who made its personality. Dora is as much part of her terroir as the indigenous grapes that grow from her sandy clay soils: she emanates a sense of place and local tradition, and you can taste her passion in each bottle. The final noteworthy comment was about this year's harvest. Most of Italy had a very hot 2011 harvest, and Montelpulciano was no exception. Dora had to start her harvest early in late August. By the time she was halfway done, her neighbors were just starting. "I harvested at optimal maturity and my alcoholic potential this year got close to 15%! Either my neighbors will be blending their juice with a lot of water or they won't be making any wine this vintage." In the morning, we checked out the vines. Most of the vines on the estate were planted in 1963 by Dora's father. "He taught me that you make good wine by working well in the vineyard. To work in harmony with the vines, to listen to them to take care of them. To make a good broth, you need a good chicken!" The vines are all selection massale and franc de pied due to a technique that Dora learned from her father where she allows a shoot to come off from the base of the vine, which eventually caps off the old stump and lets the new shoot take over as the producing vine. Her next door neighbors have just torn out their vines for the third time since Dora's were planted in order to make way for another generation of uber-productive clones pumped full of fertilizer. The ground is worked twice a year, and Dora lumps soil around the bottom of of each vine during the winter (buttage) to better resist the cold. She undoes this (debuttage) in the spring. After our tour of the vines it was cellar time. "Bloop. Bloop. Bloop Bloop. Bloop." The wine is then then racked to large oak vats (30 hl) and aged for a minimum of two years, then bottled. Dora's father bottled his wine independently and his last vintage was in 1978 (Dora says they are still delicious to this day). For reasons unclear, Dora sold her grapes to the cooperative until 1997 when she bottled her first vintage herself. The red wine is always a blend of Canaiolo, Prugnolo Gentile (a type of Sangiovese characterized by big, juicy berries) and Mammolo. The blend varies each year but is the same for each cuvée, which are bottled according to years aged in wood. One exception is the I.G.T Rosso Toscano. This wine is made with a strain of 40 year old Sangiovese called Nero Toscano, sees 6 months on average for alcoholic and malolactic fermentation in concrete, and is then aged two years in oak. We tasted a few 2010's, but more importantly the 09's which are about to be bottled. Though the fruit is young and the tannins are strong, there is already a great balance on the palate with pronounced minerality and sharp acidity. It's definitely drinkable now, but should start showing its' full potential in 5 years. Vinification: these white grapes were traditionally blended into Vino Nobile to lighten its' color and body. Dora thinks they have something to express as a white wine, effectively making this bottling to highlight its' potential. Fermented and aged in concrete tanks. Vinification: Fermented in concrete aged in small oak barrels. Vinification: Fermented in concrete and aged in small oak barrels for two years. Vinification: Fermented in concrete and aged in small oak barrels for 3 years. Vinification: Fermented and aged in concrete for 1 year.